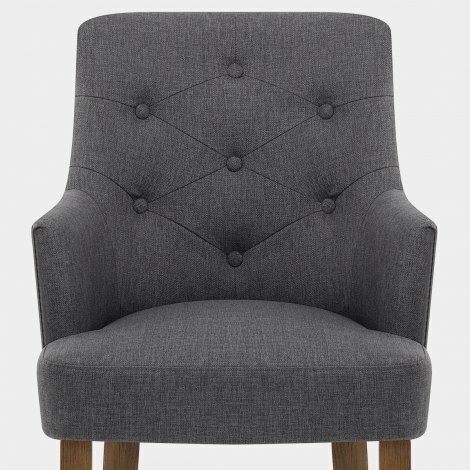 Sure to take centre stage in your home, the Broadway Oak Chair Charcoal Fabric offers the ultimate upmarket look. Breathtakingly beautiful, this encompassing design takes comfort to a new level. So what are you waiting for? Get the show on the road with the brilliant Broadway. 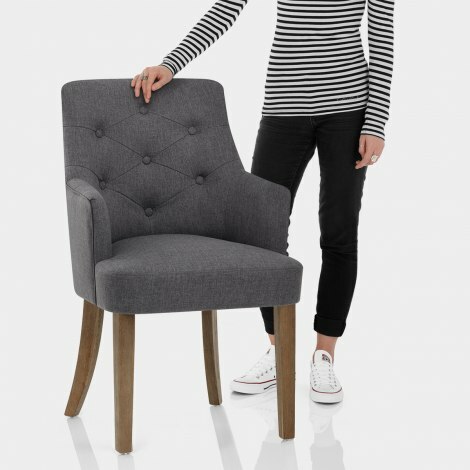 Charcoal fabric upholsters the entire seat, which is sprung and belted, whilst the tall backrest combines with two armrests for complete support. In addition, quilted buttons and piped edging add stylish details to the seat. The frame below is formed by four solid wooden legs and is complete with a charming antiqued finish. Finally, protective underside plugs allow the chair to be used in a wide range of spaces.
" Look elegant and expensive"
We wanted buttoned backed chairs but without the flashy rings or studs...these fit the bill perfectly. Look elegant and expensive and are really comfortable too. Perfect!